Psoralen (also called psoralene) is the parent compound in a family of natural products known as furocoumarins. It is structurally related to coumarin by the addition of a fused furan ring, and may be considered as a derivative of umbelliferone. Psoralen occurs naturally in the seeds of Psoralea corylifolia, as well as in the common fig, celery, parsley, West Indian satinwood and in all citrus fruits. It is widely used in PUVA (Psoralen + UVA) treatment for psoriasis, eczema, vitiligo, and cutaneous T-cell lymphoma. Many furocoumarins are extremely toxic to fish, and some are deposited in streams in Indonesia to catch fish. Psoralen is a mutagen, and is used for this purpose in molecular biology research. Psoralen intercalates into the DNA and, on exposure to ultraviolet (UVA) radiation, can form monoadducts and covalent interstrand cross-links (ICL) with thymines preferentially at 5'-TpA sites in the genome, inducing apoptosis. Psoralen plus UVA (PUVA) therapy has shown considerable clinical efficacy. Unfortunately, a side effect of PUVA treatment is a higher risk of skin cancer. An important use of psoralen is in PUVA treatment for skin problems such as psoriasis and (to a lesser extent) eczema and vitiligo. This takes advantage of the high UV absorbance of psoralen. The psoralen is applied first to sensitise the skin, then UVA light is applied to clean up the skin problem. Psoralen has also been recommended for treating alopecia. Psoralens are also used in photopheresis, where they are mixed with the extracted leukocytes before UV radiation is applied. Despite the photocarcinogenic properties of psoralen, it had been used as a tanning activator in sunscreens until 1996. Psoralens are used in tanning accelerators, although psoralen increases the skin’s sensitivity to light. Some patients have had severe skin loss after sunbathing with psoralen-containing tanning activators. Patients with lighter skin colour suffer four times as much from the melanoma-generating properties of psoralens than those with darker skin. An additional use for optimized psoralens is for the inactivation of pathogens in blood products. The synthetic amino-psoralen, amotosalen HCl, has been developed for the inactivation of infectious pathogens (bacteria, viruses, protozoa) in platelet and plasma blood components prepared for transfusion support of patients. Prior to clinical use, amotosalen-treated platelets have been tested and found to be non-carcinogenic when using the established p53 knockout mouse model. The technology is currently in routine use in certain European blood centers and has been recently approved in the US. Psoralen intercalates into the DNA double helix where it is ideally positioned to form adduct(s) with adjacent pyrimidine bases, preferentially thymine, upon excitation by an ultraviolet photon. Several physicochemical methods have been employed to derive binding constants for psoralen-DNA interactions. Classically, two chambers of psoralen and buffered DNA solution are partitioned by a DMSO). Psoralens can also be activated by irradiation with long wavelength UV light. While UVA range light is the clinical standard, research that UVB is more efficient at forming photoadducts suggests that its use may lead to higher efficacy and lower treatment times. The photochemically reactive sites in psoralens are located at each of the carbon-carbon double bonds in the furan ring (the five-member ring) and the pyrone ring (the six-member ring). When appropriately intercalated adjacent to a pyrimidine base, a four-center photocycloaddition reaction can lead to the formation of either of two cyclobutyl-type monoadducts. Ordinarily, furan-side monoadducts form in a higher proportion. The furan monoadduct can absorb a second UVA photon leading to a second four-center photocycloaddition at the pyrone end of the molecule and hence the formation of a diadduct or cross-link. Pyrone monoadducts do not absorb in the UVA range and hence cannot form cross-links with further UVA irradiation. Another important feature of this class of compounds is their ability to generate singlet oxygen, although this process is in direct competition with adduct formation and may be an alternate pathway for the dissipation of excited state energy. Research on psoralen has historically focused on interactions with DNA and RNA (in particular, ICL formation). Psoralen, however, has also been shown to block signaling of the ErbB2 receptor which is overexpressed in certain aggressive types of breast cancer. A synthetic derivative of 5-MOP, 5-(4-phenoxybutoxy)psoralen, shows promise as an immunosupressent by inhibiting a specific potassium channel. Its structure prevents intercalation into DNA, and it only very weakly produces singlet oxygen, majorly reducing unwanted toxicity and mutagenicity in vivo. This has implications for the treatment of various autoimmune diseases (e.g. multiple sclerosis, type-1 diabetes, and rheumatoid arthritis). While cell-surface modification and ion channel blocking are two newly discovered mechanisms of action, much research remains to be done. One isomer of psoralen is angelicin, and most furocoumarins can be regarded as derivatives of psoralen or angelicin. Important psoralen derivatives include Imperatorin, xanthotoxin, bergapten and nodakenetin. The structure of psoralen was originally deduced by identifying the products of its degradation reactions. It exhibits the normal reactions of the lactone of coumarin, such as ring opening by alkali to give a coumarinic acid or coumaric acid derivative. Potassium permanganate causes oxidation of the furan ring, while other methods of oxidation produce furan-2,3-carboxylic acid. Psoralen is difficult to synthesize due the fact that umbelliferone undergoes substitution at the 8-position rather than at the desired 6 position. Benzofuran reacts preferentially in the furan ring rather than in the benzene ring. 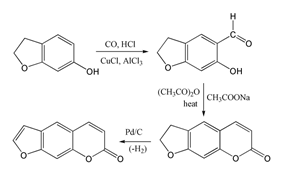 However, the 7-hydroxy derivative of 2,3-dihydrobenzofuran (also called coumaran) does undergo substitution at the desired 6-position allowing the following synthesis of the coumarin system via a Gattermann-Koch reaction followed by a Perkin condensation using acetic anhydride. The synthesis is then completed by dehydrogenation of the five-membered ring to produce the furan ring. Psoralen originates from coumarins in the shikimate pathway; its biosynthesis is shown in the figure below. The aromatic ring in 6 is activated at positions ortho to the hydroxyl group, and is alkylated by 5, an alkylating agent. The dimethylallyl group in 7 then undergoes cyclization with the phenol group to give 8. This transformation is catalysed by a cytochome P-450-dependent monooxygenase17 (psoralen 5-monooxygenase), and cofactors (NADPH) and molecular oxygen. A biosynthetic pathway in which psoralen is formed is shown in the figure below. A second P-450-dependent monooxygenase enzyme (psoralen synthase) then cleaves off 10 (in the form of 11) from 8 to give 1. This pathway does not involve any hydroxylated intermediate, and cleavage is postulated to be initiated by a radical reaction. PUVA treatment produces both DNA interstrand crosslinks (ICLs) and monoadducts. The ICLs introduced by psoralen are highly genotoxic to actively replicating cells. The covalent linkage impedes replication fork progression. Thus unlinking the ICL is required before replication can resume. The initial steps in repair ordinarily involve incisions in one parental strand on both sides of the crosslink. Subsequently, repair of the lesion can occur by an accurate or an inaccurate process. The accurate process for repairing crosslinks is homologous recombinational repair (HRR). This involves replacing the damaged information using the intact information from another homologous chromosome in the same cell. Escherichia coli cells deficient in HRR are highly sensitive to PUVA compared to wild-type cells. HRR appears to be efficient. In E. coli, even though one or two unrepaired crosslinks are sufficient to inactivate a cell, a wild-type cell can repair and therefore recover from 53 to 71 psoralen crosslinks. In the yeast Saccharomyces cerevisiae HRR is a major pathway for accurately removing psoralen-crosslinks. In wild-type yeast, the recombination events associated with crosslink removal by HRR are predominately non-crossover gene conversion events. Psoralen crosslinks in virus DNA also appear to be removed by a recombinational repair process as occurs in SV40 virus infected cells, and in herpes simplex virus infected cells. One inaccurate process for repairing psoralen crosslinks appears to employ a DNA polymerase to fill in the gap formed in the strand with the two incisions. This process is inaccurate because the complementary un-incised strand still retains a portion of the crosslink and thus cannot serve as an adequate template for accurate repair synthesis. Inaccurate repair synthesis can cause mutation. Psoralen monoadducts in the template DNA strand may also cause inaccurate replication bypass (translesion synthesis) that can lead to mutation. In phage T4, the increase in mutation observed after PUVA treatment was found to reflect translesion synthesis by wild-type DNA polymerase, likely due to imperfect proof reading capability. ^ Wu Q, Christensen LA, Legerski RJ, Vasquez KM (June 2005). "Mismatch repair participates in error-free processing of DNA interstrand crosslinks in human cells". EMBO Rep. 6 (6): 551–7. ^ Momtaz K, Fitzpatrick TB (April 1998). "The benefits and risks of long-term PUVA photochemotherapy". Dermatol Clin 16 (2): 227–34. ^ M. J. Ashwood-Smith; G. A. Poulton; M. Barker; M. Mildenberger E (1980). "5-Methoxypsoralen, an ingredient in several suntan preparations, has lethal, mutagenic and clastogenic properties". Nature 285 (5): 407–9. ^ Zajdela F, Bisagni E. (1981). "5-Methoxypsoralen, the melanogenic additive in suntan preparations, is tumorigenic in mice exposed to 365 nm UV radiation". Carcinogenesis 1981 (2): 121–7. ^ a b Autier P., Dore J.-F., Cesarini J.-P. (1997). "Should subjects who used psoralen suntan activators be screened for melanoma?". Annals of Oncology 8 (5): 435–7. ^ Nettelblad H, Vahlqvist C, Krysander L, Sjöberg F (December 1996). "Psoralens used for cosmetic sun tanning: an unusual cause of extensive burn injury". Burns 22 (8): 633–5. ^ Osselaer; et al. (2009). "Universal adoption of pathogen inactivation of platelet components: impact on platelet and red blood cell component use". Transfusion 49: 1412–1422. ^ Cazenave; et al. (2010). "An active hemovigilance program characterizing the safety profile of 7,483 transfusions with plasma components prepared with amotosalen and UVA photochemical treatment". Transfusion 50: 1210–1219. ^ Alexandru D. Buhimschi; Francis P. Gasparro (September 2013). "UVA and UVB-Induced 8-Methoxypsoralen Photoadducts and a Novel Method for their Detection by Surface-Enhanced Laser Desorption Ionization Time-of-Flight Mass Spectrometry (SELDI-TOF MS).". Journal of Photochemistry and Photobiology 90 (1): 241–246. ^ Gasparro, editor, Francis P. (1988). Gasparro, Francis, ed. Psoralen DNA photobiology. Boca Raton, Fl. : CRC Press. ^ Wenle Xia; David Gooden; Leihua Liu; Sumin Zhao; Erik J. Soderblom; Eric J. Toone; Wayne F. Beyer Jr; Harold Walder; Neil L. Spector (February 14, 2014). Cheng, Jin, ed. "Photo-Activated Psoralen Binds the ErbB2 Catalytic Kinase Domain, Blocking ErbB2 Signaling and Triggering Tumor Cell Apoptosis". PLoS ONE 9 (2): e88983. ^ Alexander Schmitz; Ananthakrishnan Sankaranarayanan; Philippe Azam; Kristina Schmidt-Lassen; Daniel Homerick; Wolfram Hänsel; Heike Wulff (November 2005). "Design of PAP-1, a selective small molecule Kv1.3 blocker, for the suppression of effector memory T cells in autoimmune diseases.". Molecular Pharmacology 68 (5): 1254–1270. ^ a b Dewick, P.M. (2009). Medicinal Natural Products: A Biosynthetic Approach (3rd ed.). Wiley. pp. 164–5. ^ Cole RS, Levitan D, Sinden RR (1976). "Removal of psoralen interstrand cross-links from DNA of Escherichia coli: mechanism and genetic control". J. Mol. Biol. 103 (1): 39–59. ^ a b Sinden RR, Cole RS (1978). "Repair of cross-linked DNA and survival of Escherichia coli treated with psoralen and light: effects of mutations influencing genetic recombination and DNA metabolism". J. Bacteriol. 136 (2): 538–47. ^ Saffran WA, Ahmed A, Binyaminov O, Gonzalez C, Gupta A, Fajardo MA, Kishun D, Nandram A, Reyes K, Scalercio K, Senior CW (2014). "Induction of direct repeat recombination by psoralen-DNA adducts in Saccharomyces cerevisiae: defects in DNA repair increase gene copy number variation". DNA Repair (Amst.) 21: 87–96. ^ Hall JD (1982). "Repair of psoralen-induced crosslinks in cells multiply infected with SV40". Mol. Gen. Genet. 188 (1): 135–8. ^ Hall JD, Scherer K (1981). "Repair of psoralen-treated DNA by genetic recombination in human cells infected with herpes simplex virus". Cancer Res. 41 (12 Pt 1): 5033–8. ^ Yarosh DB, Johns V, Mufti S, Bernstein C, Bernstein H (1980). "Inhibition of UV and psoralen-plus-light mutagenesis in phage T4 by gene 43 antimutator polymerase alleles". Photochem. Photobiol. 31 (4): 341–50. Dean, F.M. (1963). Naturally Occurring Oxygen Ring Compounds. London: Butterworths. The Merck Index (7th ed.). Rahway NJ: Merck. 1960.